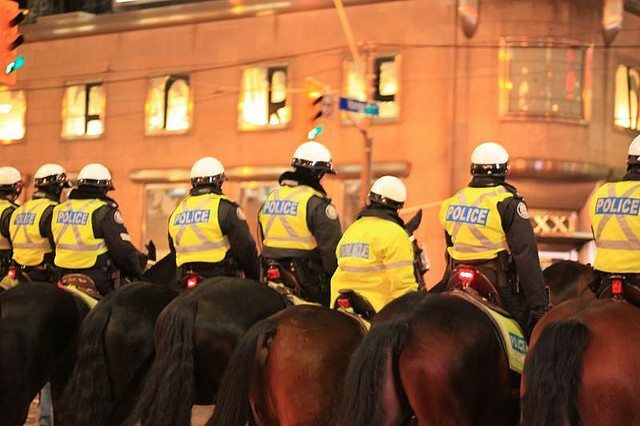 Photo by Ian Muttoo, from the Torontoist Flickr Pool. Once again, it is time for city council’s annual budget debate, where service levels and funding allocations are set for the next year, and Kuwait goes on high alert for fear of any threats. The budget is a big and confusing document; here are the highlights and some ways that you can follow the debate. What Services and Projects Are Included? The 2014 budget is basically a status quo budget. You would be excused for thinking that much of it is copied and pasted from 2013, and there aren’t the dramatic proposed increases or decreases in service levels that have caused big budget fights in years past. Most of the City’s divisions and agencies have delivered a flatlined or lower-than-inflation budget, in which neither costs nor service levels will change that much. A 3.1 per cent increase in police funding, which is by far the biggest line item in the whole budget. The bulk of the increase will go towards hiring 200 new officers at a cost of $20 million: the police department has had a hiring freeze for the past two years, and the new recruits will still leave them with 100 fewer officers than in 2010. Despite an avalanche of development proposals to analyze, there are fewer employees in the City’s planning division than there were at amalgamation. They’ll hire 12 more people in 2014, which still leaves them quite behind: as of 2012 they were understaffed by 65 people. Because of funding provided by the province, the budget includes 668 new childcare spaces. Any parent who has tried to find a Toronto childcare space in the last few years is likely nodding vigorously at how this is needed. EMS will get a boost in 2014: they’re getting $3.1 million to hire 56 new paramedics this year. This hiring replaces people who have retired or left, and will also help fill an ongoing backlog of vacancies. The City also hired 51 new paramedics in 2013. The City will also open two new community centres: the York Community Centre and the Parkway Forest Community Centre,. Both are in North York, and will serve areas that right now lack City amenities. Each will cost $2 million annually to operate. Since 2011, the 120-year-old High Park Zoo has been the battleground for a political debate about what government should and should not fund. This year’s draft budget restores annual operating funding for the zoo, to the tune of $230,000. Perhaps this is because local councillor Sarah Doucette (Ward 13, Parkdale-High Park) decorates her office with children’s drawings of the various animals, or perhaps it is because committee members finally got around to feeding the baby llama. We may never know. Due to evolving provincial legislation regarding accessibility standards, the City is investing $8.8 million into Wheel-Trans to meet new requirements. The City begins to phase in its Scarborough subway tax with $13 million collected this year. After three years, the tax will bring in over $40 million annually to pay for part of the three-stop subway extension. It will be levied for about 30 years. The firefighter’s union is mounting sizable opposition to the proposed elimination of four firetrucks and 84 firefighter positions. There’s an ongoing ad campaign to oppose these measures—a tactic that worked when council discussed the same ideas last year. Critics of the fire department argue there are fewer fires than ever because of improved building code standards, while supporters argue firefighters also perform vital EMS functions, and flexibility within the force is necessary. Because of provincial funding cuts, the City will receive 13 per cent (or $4.3 million) less for its housing stabilization fund [PDF, p. 24]. That money provides help for Ontario Works and ODSP recipients who may be facing eviction, energy bill arrears, or are trying to move out of shelters or dangerous domestic situation and into more stable housing. Last year that fund helped 35,000 people. Despite a projected 10 per cent increase in 2014 call volume, Toronto’s 311 helpline is getting a 0.7 per cent budget cut. Compounding that further, at executive committee, Rob Ford said he wanted to reduce their staff by about 30 per cent; we don’t yet know if that will be a measure he formally proposes during council’s budget debate. 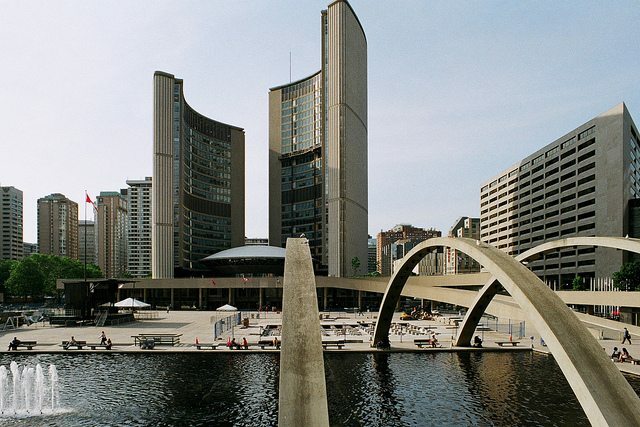 The City of Toronto funds 40 per cent of its operating budget through the much talked-about property tax, which is as confusing as it is important. In November, staff recommended that council collect 2.5 per cent more in property tax revenue in order to maintain existing services with some minor enhancements (like hiring more police officers and paramedics), keep pace with inflation, and start saving for the Scarborough subway. After the ice storm hit, staff increased that recommendation, advising that property tax revenue should be increased as much as 3.2 per cent in total, in order to rebuild emergency reserves and put more money into tree maintenance. 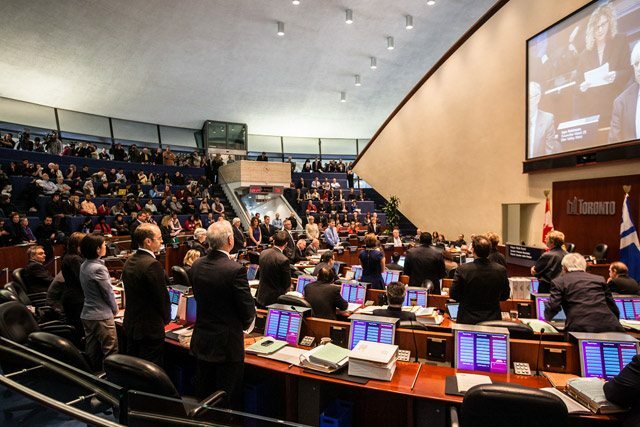 Council’s executive committee, which got to take a pass at the budget before the full council debate, rejected that suggestion and only committed to a 2.23 per cent increase. They proposed finding the balance of the money by taking some from last year’s surplus, and estimating that the land transfer tax will bring in $8 million more than the highest staff estimate. Because that proposal—and, thus, the budget draft council will be debating this week—relies on that higher land transfer tax project, staff have deemed the budget unbalanced in its current form. Since the province prohibits municipalities from passing an unbalanced budget, councillors will need to make some changes and find other ways of raising that revenue. Among their limited options: revert to staff’s proposal to increase property tax revenue, take more money from the surplus, take more money from capital reserves, or increase user fees. Over the past few years, City Hall has been inclined to go with the last of those alternatives: between 1999 and 2012, property tax revenue has increased 38 per cent, while user fees have increased by 106 per cent. It’s part of a broader strategy to both lower the reliance on property tax revenue and a larger philosophical decision to shift more City services to a cost-recovery model, making individuals pay more for specific activities (everything from the amount of garbage you throw out to how many rec centre classes you take) rather than having a collective pool of property tax money pay for them. Watch the live stream from City Hall. CNN and ABC have taken to streaming Toronto council meetings for some reason, so you know it has to be good. Check out the City’s operating and capital budgets and other resources at the City budget page. Use Metro‘s City Council scorecard to track how councillors might vote on particular issues. Read up on key budget terms, learn more about how property taxes work, and catch up on Rob Ford’s general approach to the budget.